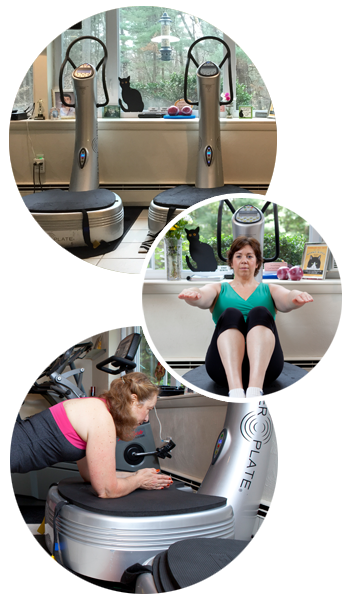 Power Plate is the future of fitness! The Power Plate is a revolutionary fitness and rehab tool that provides whole body vibration technology developed by the Russians in the 1960’s to keep their cosmonauts in space longer. Soon adopted by NASA for our own astronauts, this technology helped them to regain bone and muscle mass after their time in space. Adapted for athletes and the rest of us; it’s truly the wave of the future! My personal experience with the Power Plate has reshaped my body in a fraction of the time! The vibration works on the body from the cellular level speeding up the process of strength, tone, flexibility, balance, etc. It causes the muscle fibers to contract and release at a far greater rate then they could do on their own, thereby speeding up the results. What I can do with 30 minutes on the Power Plate now used to take me much longer with traditional exercise machines. I’ve been using it for 10 years now and am always amazed at the results. Many of my clients have reversed their bone loss with vibration technology. Another one healed her compound fracture of her ankle and foot in 5 weeks without surgery! Pain reduction, spinal rehab for everything from osteoarthritis to herniated discs to post spinal surgery, spinal stenosis and more – the Power Plate makes it possible! I’ve been working with Deb off and on since 1997. She has a fully equipped exercise area on her lower floor and it’s a very pleasant atmosphere to work out in. She has a somewhat unique piece of equipment called a Power Plate that accelerates the workout with vibration technology. She uses Stott Pilates equipment and that is incorporated into the routine. I find her to be knowledgeable about diet as well as exercise and I thoroughly enjoy my sessions with her.